This image was taken when the state adopted the plan to make an American Indian/Alaska Native curriculum mandatory. Pictured, from left, are Matt Eide, Education Northwest (co-facilitator); April Campbell, ODE (co-facilitator); Se-ah-dom Edmo, Oregon Indian Education Association Chair (Advisory Panel member); Robin Butterfield, Independent Contract (Advisory Panel Member); Artis Clark, Jefferson County School District (Advisory Panel Member); and Rob Saxton, ODE Deputy Superintendent of Public Instruction. A new American Indian/Alaska Native State Plan moves Oregon ever closer to making a Native American curriculum mandatory in all public school districts. When it happens, it will join a still way too short list of states, with neighboring Washington added to it this spring, to issue a similar directive. 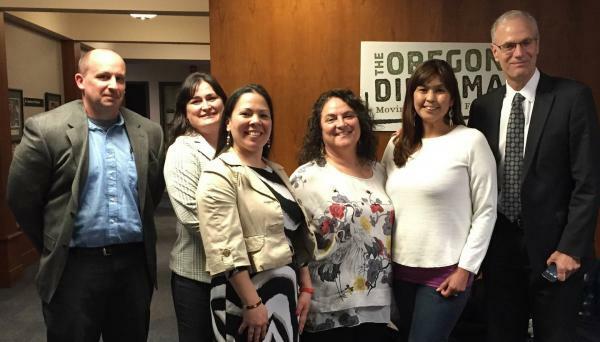 The new two-year plan, developed over a nine-month period by the 26-member AI/AN Advisory Panel, which includes representatives from each of the state’s nine tribes, was adopted by Oregon’s State Board of Education in April. Under the plan, all 197 school districts will implement a “historically accurate, culturally embedded, place-based, contemporary, and developmentally appropriate AI/AN curriculum.” While ultimately it is up to Oregon’s legislature, the plan states that the Oregon Department of Education (ODE) will support and assist in the development of legislative language for a mandate in the 2017 session. Under the previous plan, issued in 2006, school districts were “encouraged to implement AI/AN curriculum and instructional materials.” While some have, the information taught is often outdated or inaccurate. Tammie Hunt, education director for the Cow Creek Band of Umpqua Tribe of Indians and a member of the AI/AN Advisory Panel, said about a year and half ago, she learned that schools in the Medford 549c district, where some Cow Creek students are enrolled, were teaching information from 1963 sources. In the 1960s, many of Oregon’s tribes were terminated. “They did pull the curriculum. They finished teaching it at the end of this year, from what I understand. They were supposed to do something this summer to update it,” Hunt said. A few school districts, however, have made a good effort, albeit recent, to get it right. Hunt pointed to Salem Kaiser, which just developed an interactive curriculum that incorporates direct input from all nine tribes. In June, Hunt and representatives from other tribes spent the day in a classroom going through the curriculum as if they were the students. Ramona Halcomb, education director for the Confederated Tribes of the Umatilla Indian Reservation and also a member of the AI/AN Advisory Panel, said Pendleton School District has come a long way. Not only did the district approach the Umatilla for assistance in developing a curriculum for a two-week Oregon Trail program, but teachers and administrators have attended cultural events, a few even participated in a sweat with Halcomb, and new teachers have orientation at the tribal museum. “Ever since the boarding school heritage, developing trust and developing that time to connect with communities is what’s important and what’s so needed—and Pendleton does that extremely well,” Halcomb said. Including the culturally relevant curriculum, the new plan contains 11 state educational objectives, ranging from increasing AI/AN attendance and graduation rates to meet or exceed state levels to districts recruiting a minimum of 5 percent AI/AN educators and ensuring that educators receive AI/AN responsive training at least once per year, to boost outcomes of Indian students. The plan contains strategies for each objective, though the finer details need to be worked out. “Now we are developing subcommittees that are taking each of the goals and developing action plans—the how this will actually unfold,” said ODE’s Advisor to Deputy State Superintendent on Indian Education April Campbell. Undoubtedly, there will be challenges in meeting these objectives. Take the 5 percent AI/AN educator target. Halcomb called it a “lofty goal,” but with Native American students dropping out of Oregon public schools at a rate 6.8 percent (2013-2014)—the highest in the state—aiming high is better than aiming low. As Halcomb sees it, through collaboration with the tribes and other entities dedicated to increasing diversity in the education workforce, it is not an unachievable goal. For instance, she would love to see school districts matching tribal scholarships for students pursuing teaching careers. They also need to brainstorm ways to promote teaching as a worthy profession to go into. Out of the 160 Cow Creek students currently receiving tribal scholarships, none are in teaching programs. “Going into teaching is really tough. You are so governed by rules and regulations,” she said. Despite the challenges, Campbell is excited about the updated plan, which also provides for a full-time Indian education specialist. She said they took a look at what other states, such as Minnesota, Montana, and Washington, are doing and trying to learn from their successes. This entry was posted in Education, News and tagged American Indian/Alaska Native, education, Native American curriculum, Oregon, schools by Kim Kalliber. Bookmark the permalink.